One of my favorite Bible stories comes from the book of Ruth. It is the prototype for all faith travel. It captures the mysterious dynamic of the life-changing pilgrimage experience. Standing there, you remember the angels who sang to shepherds in that field, announcing the Messiah’s arrival, but you also remember the things of the Old Testament: the fall of Jericho and Rahab who helped save God’s people. You think of her son Boaz and Bethlehem where he lived. Your mind goes to Naomi who left Bethlehem and traveled to Moab (Jordan) with her husband during a time of famine and settled there until her husband and both sons died. But mostly, you think of Ruth, Naomi’s daughter-in-law. Ruth provides us with a glimpse into the mystery of pilgrimage, what it is, how it changes us, the gifts it yields. After Naomi lost her husband and sons, she returned to Bethlehem along with Ruth. That is it. That’s how pilgrimage feels. It isn’t just about visiting a place; it is about becoming part of a place. I don’t just find myself; I find God. I become part of God’s larger family. It is the experience of every person who says yes to the God quest. It is appropriate that my recent pilgrimage to the Holy Land began at Shepherds’ Field, also known as Boaz’ field. I thought of all of these things. I also thought about how the story ended, how Ruth married Boaz and had a son named Obed, who had a son named Jesse, who had a son David. How King David‘s descendent was Jesus Christ. How angels filled that same field where shepherds tended their sheep and announced the birth of the Savior. From the first moment of a pilgrimage, God has our hearts fully engaged. Sure, the days will take us deeper into the pilgrimage experience and show us things we have never known, but even from the first few minutes, we are there with Our Lord – and the world we left behind falls away. It is all about our pilgrimage to one holy land after another, and we each leave our Moab behind. During our ten-day pilgrimage with Select International, we visited all of the key places where the Bible comes alive: Bethlehem, Caesarea on the Mediterranean Sea, Mount Carmel, Nazareth, Cana, Mount Tabor and the Mount of Beatitudes, Capernaum, the Sea of Galilee, Jericho, the Mount of Olives, Jerusalem and Ein Kerem (Ein Karem). The Sea of Galilee was a favorite spot. It provided a respite from walking, a time for reflection, a closeness to the Lord and one another that brought many to tears and generated much laughter, singing, and dancing. The Sea of Galilee has the ability to heal the soul, to bind the group to one another, and to make the Lord’s presence real. Others had favorite spots and moments of grace that were perfectly suited to them and to what Jesus Christ wanted to do within them. The rest of us were delighted when God visited each of our fellow pilgrims in these unique and personal moments. We each realized that Our Lord was traveling with us. A pilgrimage isn’t a vacation. Some things are common to all travel experience. People who travel internationally for vacations (as opposed to pilgrimages) also enjoy nice hotels and exotic foods. Spiritually-based trips are unique. We pray the Mass together daily, we participate in charitable programs like “Sharing the Bread”, we pray at the Western wall. Simple bonding moments are made possible while on pilgrimage; they find easy expression, organically occurring between people who have prayed with one another and for one another. On our pilgrimage, we swapped life stories, shared resources, helped fellow pilgrims make the trek through difficult terrain, up the steps and over the stony paths. But it was all a journey, a Ruth-with-Naomi kind of trek. We ate together, lodged together, experienced God together. We made the logical journey from the Sea of Galilee, which feeds the Jordan River, which in turn spills into the Dead Sea. And we floated in that salty sea. It was a logical, geographical progression in the itinerary. North to south, by way of the primary water route. We also made a chronological biblical journey from Bethlehem where the Lord was born, to Galilee where Jesus’ ministry began, to Jerusalem where the Holy Spirit descended and the people went out into the world with the message – to every people of every nation. We marveled, because that same message had come to us (a couple from Louisiana, a widow from Texas, a divorced woman from Kansas City, a writer from Missouri, and others). Like Ruth, though, we discovered that this journey was not just about faith and the history of a place, it was also about the people, the culture, the places we stayed, the food we ate. This bond was made as we ate together, rode the bus together, prayed together. We began to anticipate the needs of others, to share our supplies, to laugh when another rode a camel. It happened when we prayed over another person who was struggling with a physical issue – or a spiritual one. It happened when we shared a bottle of wine from the place where Jesus Christ turned water into wine. Or we took a bottle of wine home from Bethlehem and made plans to open it on Christmas Eve and say a prayer for the Christian family we met one night when we participated in a special program called “Sharing the Bread”. The first two days in Bethlehem, we visited Shepherds Grotto, The Church of the Nativity, and The Church of St. Catherine. Then, we gathered in the homes of Christians of Bethlehem and broke bread together. When one steps away from the bus and the well-beaten pilgrimage path to enter into the homes of the people who live in the country, we encounter divine grace in a remarkable way. Miracles happen in times like this. People are changed, friendships formed. This Christmas, when I think of Bethlehem, I will remember that night and the five people I met in a humble home in the city of Our Lord’s birthplace. I will never again think of the holy sites there without thinking of our fellow Christians who struggle to make ends meet because they live in a place where they make-up two percent of the population and, statistically, are in the lower class and unable to rise above that level no matter what their education or line of work. Our “Sharing the Bread” host family made us a meal called Mensaf. You can google the recipe and even find a version of it on the Epicurious website, but I guarantee that you will not be able to replicate this meal – not the meal we had, because we shared it in the home of fellow Christians who live in Bethlehem. The Bannourah and Salman families live together in one small apartment, and they invited us into their home. They became our Naomi, our Boaz, our family. And we laughed together, swapped stories, and wiped away tears. These are the living stones of Bethlehem. They could leave this place. Thirty years ago, the Christian population in that area was ninety percent. Now, they make up just two percent of the population. Why do they stay? They stay because this is the birthplace of their Lord Jesus. This is home. It is an inheritance on a spiritual level, and even if things are difficult as minorities, they say they will stay. And we will have a Bethlehem to visit on pilgrimage because they are there to make sure that heritage is preserved. 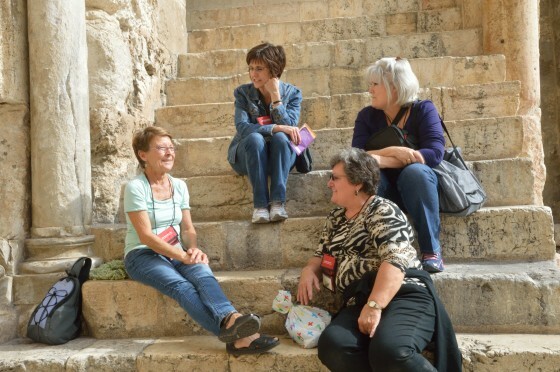 The Select to Give program seeks to connect U.S. based Christians making pilgrimages to the Holy Land with Christian families who live there. The “Sharing the Bread” program is part of the larger not-for-profit Select to Give foundation. The shared meal between Christians is a beautiful experience. Holy. Precisely what we should be about as Christian pilgrims. It is right to break bread together and become one with them. The House of Bread (another name for Bethlehem) took on new meaning for me that night. This is not the stuff of vacations. It is the essence of pilgrimage. It is about people, lodging, and culture and how these things have a divine synergy of their own. I have stayed in a number of hotels in the Holy Land. My favorite was The Saint Gabriel Hotel (Bethlehem), and it was my favorite because it seemed perfectly designed for a spiritual pilgrimage. Before we even passed through the large revolving doors and encountered the grand lobby, a commanding statue of Archangel Gabriel greeted us. Clearly, this hotel strives to draw the faith traveler in to the pilgrimage experience. It also has a personal touch that is ideal for the first few nights of any pilgrimage, when the people are a little uncertain, a little apprehensive, and somewhat timid. Last May, I stayed at the Leonardo in Tiberias, and my room had a balcony on the 11th floor that overlooked the Sea of Galilee. The hotel had some Old Testament artwork in the lobby and a mezuzah on the doorframes, but the calling card for me was the Sea of Galilee which automatically drew me into the stories of the New Testament and to my walk with Jesus Christ. There is another option at the Magdala Center (Galilee), portions of which are currently under construction. Pilgrims can pray the Mass at a chapel in which the priest stands before an altar which is positioned within a boat. The Sea of Galilee is visible through the window behind the altar, and the priest appears to be delivering his homily just as Jesus might have preached a sermon from a boat on that same sea. When I return to the Holy Land, I would like to make Magdala part of my next pilgrimage experience, visit the first century synagogue, the women’s center that features women of salvation history, and perhaps stay at the guest house on location. I would also like to find out more about a guest house located on the Mount of Beatitudes, which I consider the most beautiful spot in the Holy Land besides the Sea of Galilee. In Jerusalem, The Notre Dame du Lac Hotel is well-suited for Catholic pilgrims who are drawn to the artwork, statues, and Catholic themes. They had an exhibit on the Shroud of Turin that brought many to tears. The life-sized image of our Lord’s body, as it might have looked in the tomb, inspired the pilgrims to an impromptu veneration – something like the Veneration of the Holy Cross on Good Friday. Food is universal. Whether Protestant, Catholic or Orthodox, it binds us together. It feeds the body and the conversation. There are a few meals and restaurants that stand out in my memory. The journey to the Holy Land was worth the roasted eggplant with a pomegranate reduction syrup and rice dish called Maglubeh (“upside down”) served at The Eucalyptus Restaurant (Jerusalem). The featured dish has a traditional blessing ceremony in which one runs the palm of his hand over the inverted pot seven times before lifting the pot and revealing the saffron-infused chicken and rice dish. The pilgrims from Louisiana said it was like jambalaya, though with different spices. It reminded me of the traditional Spanish meal of seafood and rice called paella. Beef-stuffed artichokes at the Kibbutz Ramat Rachel Restaurant take second place in my memory. But, the Tex-Mex folks will probably long remember the gigantic (30 inch diameter) tortilla-like bread at the Sahara Restaurant. Though not exotic, the fish at the Tanureen Restaurant on the day we visited Capernaum is memorable because we had just meditated on Our Lord’s call to the disciples when He made them fishers of men. The Tent Restaurant located in Shepherds’ Valley Village between Shepherds’ Field and the Nativity Church wins the prize for most exotic atmosphere, with its Bedouin style rugs and tapestries. The hotels had massive buffets every morning and evening, with salad, and feta, and hummus as a standard offering. We enjoyed a falafel at street vendors , and I bought some hyssop which I brought home to sprinkle on feta or in soups as culinary reminder of our journey together. A leader to guide them. Our pilgrimage leader, Ceci Triska, began each morning with a sweet, memorable prayer that is still stuck in my head: Goodmorning, dear Jesus. I give you this day ... She was quick with gentle reminders (the first bathroom you find is always the busiest so wait, take the pictures and keep moving for the sake of others). She was quick to point out the ideal vantage point for photography. She was an encourager, gifted with a spirit of hospitality, running to the pharmacy for another pilgrim, making last-minute-upgrades to the itinerary when unforeseen obstacles made a planned stop impossible. She was our Naomi. Where she went. We went. Like vacationers, pilgrims want to shop, but we shop with a different mindset. We want reminders of the pilgrimage experience. There are many shopping options for those on a faith journey. The worst option is the street vender who sells postcards for a dollar and “silver” crosses for five dollars. Shopping in the Old City is a better option. The items there may not be the best quality, but there is something to be said for the experience of bartering, the ambience, the aroma of the food & spices, the wares spilling into the little streets, the people of every language and culture coming together. In Israel, though, the little shops that are adjacent to some of the holy sites provide a venue for shopping for small items that is peaceful, faith-filled, and an integral part of the pilgrimage experience. Some of the best places to shop for a Christian pilgrim are the Christian-owned stores in Bethlehem. Here, the faith-trekker will discover fine artwork and carvings, with proceeds supporting Christians of Bethlehem. During my May and November visits, I encountered three Christian shops in Bethlehem. My favorite was owned by Shibly Kando, the grandson of the man who discovered the Dead Sea Scrolls. This Christian store has items of the highest quality. Visitors can choose from olive wood carvings (especially Nativity Sets), fine jewelry, or rare pieces of antiquity. When pilgrims find a piece that speaks to them, they buy it – often with tears in their eyes. In moments like these, even shopping becomes an occasion for grace. In May 2014, I purchased a Jerusalem stone mezuzah that came with the Shema (passage from Deuteronomy). The Jewish mezuzah is affixed to the doorpost or gate, a tradition that has been around for thousands of years. In November 2014, I purchased a shofar, the ram’s horn that was blown as the walls of Jericho fell in the Old Testament story. In November, I also bought a fine olive wood carving of the Holy Family’s flight into Egypt. It is a symbol of my passion for pilgrimage, my desire to travel with Jesus Christ wherever that journey may lead. In November, we flew Turkish Airlines, and it was a wonderful experience. In May, I flew via El Al Airlines. Our El Al flight had a large Jewish population who love their faith, and I greatly respected their faithful adherence to a prayer schedule even when in flight. As the landing gear hit the runway in Tel Aviv, they clapped their hands, some cried. That said, I prefer Turkish Airlines. The flight crew was very attentive and the amenities were a nice surprise. I discovered Turkish Delight on my flight. It lives up to its name. On my return flight, a gentleman seated next to me suggested that I try an alcoholic beverage called Raki (Turkish liquor). The alcohol on Turkish Airlines is complimentary, and it seemed a good time to try something new. “Add a little water to the Raki first, and it will turn a milky-white color,” he said. That was supposed to give it a smoother licorice flavor. Next time I fly with Turkish Airlines, I’m sticking to the red wine, but sometimes, you have to be a little adventurous. I would be happy to have a pilgrimage to the Holy Land on the books every six months. Once you go, you simply must go back. And you find yourself telling others about your journey. You are no longer Ruth. You are Naomi now. And they are Ruth, saying, where you go, I will go. Denise Bossert is a syndicated Catholic columnist for U.S. diocesan newspapers and has been published in 63 newspapers. Her first book will be released by Ave Maria Press in March 2015. She currently works as a travel writer for Select International Tours and Cruises.